I live in Ward 21 - St. Paul's - in the City of Toronto. I'm just an ordinary citizen, but once in a blue moon, I have something to say about my 'hood. So I'm putting my fingers where my mouth is and starting a blog. Feel free to share your thoughts about W21 too. I was walking with my kids to the subway station this morning, I saw that without the police directing traffic, people are still stopping and not turning on the red light (as was required before the changes due to construction). Backs up everything on Eglinton. 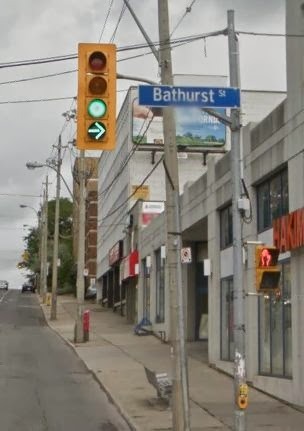 Something just like at the corner of Bathurst and Eglinton. A signal with a dedicated right turn arrow. When the light is red for cars traveling west beyond the station, and the pedestrian no-cross signal is up, the green right turn arrow can come on and cars can keep flowing north on the Allen. Then, when there is a green signal allowing cars to drive west and the pedestrians can cross, the green right turn arrow goes off and cars can only turn right onto the Allen when it is safe to do so. I can't really think of a downside to this. If you can, please post a comment.